Spellbinding Circle appears in this card's international artwork. A reversed version of Dark Magical Circle appears in both of this card's Japanese artworks. 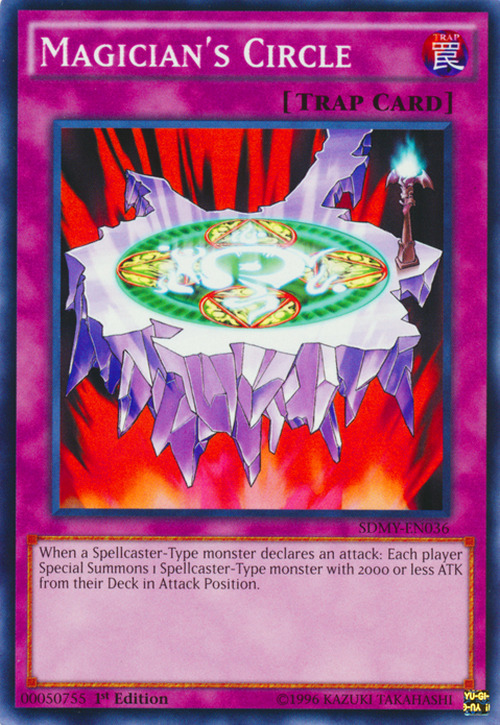 Monsters like "Fortune Lady Earth" do not have a defined ATK, so cards like "Magician's Circle" and "Limit Reverse" may not Special Summon them from the Deck or Graveyard. : Can cards like "Magician's Circle" Special Summon monsters like "Fortune Lady Earth" which have undefined ATKs? There is no attack declaration when battling by the effect of "Equip Shot" - it moves the game forward to Damage Calculation when resolving the effect. Card like "Mirror Force" and "Sakuretsu Armor" cannot be activated because of this. : When battling by the effect of "Equip Shot", can "Sakuretsu Armor" be activated?